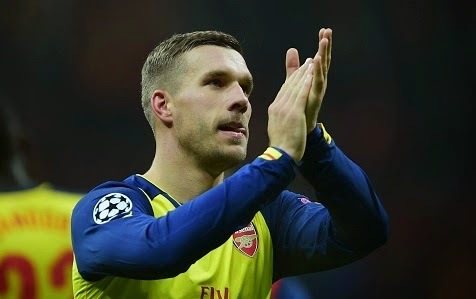 Arsenal agree striker deal Lukas Podolski’s deal Premier League side Arsenal have reached an agreement with Serie A side Inter Milan for their forward Lukas Podolski. Premier League side Arsenal have reached an agreement with Serie A side Inter Milan for their forward Lukas Podolski. The reports are now coming in every second for the German striker that he is set to finalize his move in the next 24 hours. The last two months have been busy in linking Podolski with the Italian side. And finally today, the transfer window is officially opened and the World Cup winner will complete his deal. Podolski will join Inter for the rest of the season with an option to buy him in the summer. It is already expected that Inter will sign him on a permanent deal in the summer as Arsenal are now not interested in his services. Inter confirmed the arrival of the German forward via twitter. Podolski said on joining Inter that his aim is to help the team to qualify for the Champions League stages and to win Europa League. Inter boss Roberto Mancini who has admired him several time said that his arrival will give boost in the attacking area. Mancini answered a question on twitter that he knows him very well, he followed him when he was at Bayern Munich and recently at Arsenal. The strong left-footed player will be a great addition to Inter squad. worst decision by wenger !